Happy 18th Birthday Liam. Not such a late start today, I managed to get a full 7 hours sleep for the first time in days. 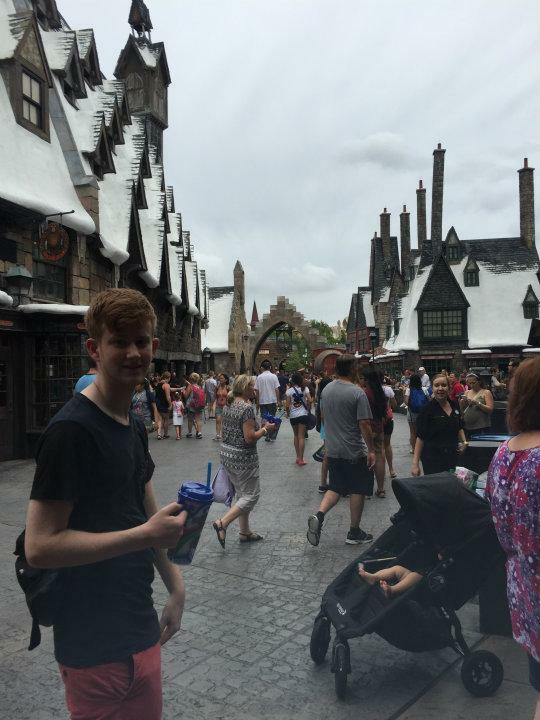 We made our way to Universal Studios and were blown away by the size of the place. Liam chose to do Islands of Adventure for his birthday and we had a blast. It started with the Spiderman ride, followed by Skull Island reign of Kong, Jurassic Park River Adventure and then on to The Wizarding World of Harry Potter - we were only half way through. The attention to detail to the buildings, rides and cleanliness of the park were amazing, even down to the rubbish bins and water fountains fitting were made to fit in with their surroundings. We brought a $10 drink bottle which you can fill up at any vending machine around the park for nothing. The drinks included all cokes including cherry, vanilla, lime and others I can't remember. Fruit drinks and diet drinks but guess what - no water. We then headed to The Lost Continent, Seuss Landing and on to the incredible Hulk rollercoast ride which Dylan rode 3 times. By this stage I was starting to feel sick so gave up the rides for the rest of the day. Liam still hadn't ridden a proper rollercoast - oh well there is always tomorrow. We then went back to Harry Potter for another ride and to catch the Hogwarts Express over to Universal - a whole other world awaited us at the other end. It was the best day and we will do it all again tomorrow.